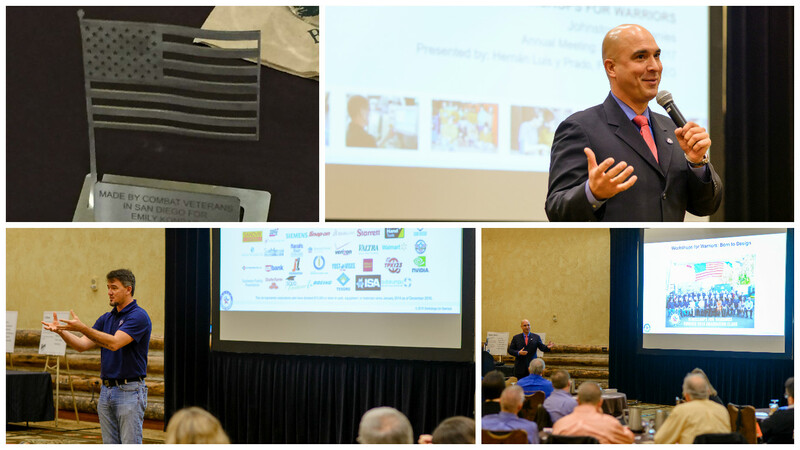 A few snapshots from Hernán and John’s presentation! Founder, Hernán y Luis Prado, and John Jones, their Director of Development used touching personal stories that explained why their school was seeking to solve two systemic economic issues. The first is to rebuild America’s advanced manufacturing infrastructure by providing a nationally scalable and repeatable model to train and certify. The second is to provide transitioning service members and Veterans with a path for a successful civilian life. Before dinner Wednesday evening, Susie presented Hernán and John a donation of $10,000 to establish the Johnston Industrial Supply Scholarship. 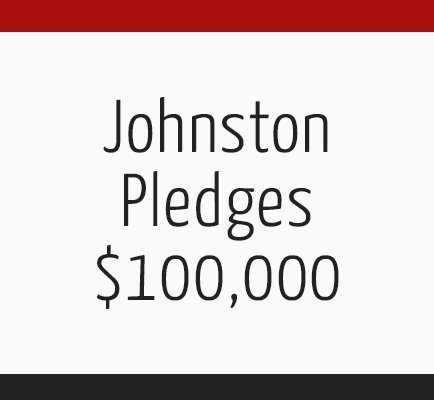 Susie surprised all by announcing that Johnston will donate $100,000 of the next 4 years. 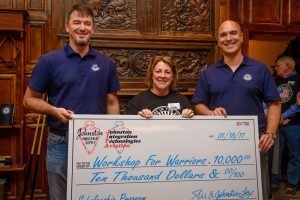 Johnston will provide training for 4 transitioning service members or Veterans! Left to Right: Workshops for Warriors Director of Development John Jones, CEO and President of Johnston Companies Susie Johnston Fox, and Workshops for Warriors CEO and Founder Hernán Luis y Prado receiving a $10,000 check. Veterans, Wounded Warriors, Transitioning Service Members and their dependents are eligible to apply. According to Prado, there is a waitlist of more than 500 Veterans requesting admission. WFW offers classes in Advanced CNC Manufacturing, CAD/CAM programming, advanced welding/fabrication, and machinery repair. The Ford Foundation pronounces there are 2.3M unfilled U.S. Advanced Manufacturing jobs due to the lack of skilled labor. Between 2011 and 2016, WFW has trained and certified 338 Veterans, with a combined 1,400 nationally recognized third-party credentials. In 2015, 94 percent of WFW graduates obtained jobs in advanced manufacturing after completing their programs. More information is available at www.wfwusa.org.